Sister Alberta Grimme, CSJ, 97, died Thursday, October 27, 2016, in the 79th year of her religious life as a Sister of St. Joseph. 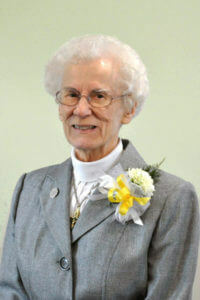 The daughter of Herman and Myrtle Gartland Grimme, Sister Alberta entered the Congregation from St. Mark Parish, Altoona, PA.
For nearly 60 years, Sister served as a teacher in the dioceses of Pittsburgh, Altoona-Johnstown and Greensburg. She primarily taught first- and second-graders in schools that included Holy Name in Ebensburg (1977-89), St. Titus in Aliquippa (1967-77), and St. Bernard in Pittsburgh (1960-66). She often expressed how she “dearly loved teaching” these grades, especially preparing the “little ones” for their First Holy Communion. Sister also spent five summers at St. Joseph Infant Home in Ebensburg where she helped tend to the needs of babies and young children. Following her education ministry, Sister Alberta cared for her youngest sister, Janie, until her death. One of 10 children, she followed her oldest sister (Mary Albert) into the Congregation. Sister Alberta is survived by two sisters-in-law, nephews, grandnieces and grandnephews, the Associates, and the Sisters of St. Joseph of Baden. Friends will be received from 1 to 8 p.m. on Sunday, October 30 and from 11 a.m. to 2:30 p.m. on Monday, October 31 at the Motherhouse of the Sisters of St. Joseph in Baden. Prayer vigil is at 6 p.m. on Sunday, October 30 at the Motherhouse. Mass of Christian Burial will be offered at 3 p.m. on Monday, October 31 in the Motherhouse Chapel. Burial will follow in the Sisters’ Cemetery on the Motherhouse grounds. Donations in the name of Sister Alberta may be sent to the Sisters of St. Joseph Memorial Fund, St. Joseph Convent, Development Office, 1020 State Street, Baden, PA 15005. Make a donation in memory of Sister Alberta.